Both butterflies and moths are insects that belong to the order Lepidoptera. Like all insects their bodies are composed of a head, thorax (the chest region), and abdomen. Most have six jointed legs (3 pairs) and almost all butterflies and moths have wings. What separates butterflies and moths from the other insects is that both butterflies and moths have scales on their wings. These scales give their wings their color. Butterfly scales are thinner than those of moths. The scales of both butterflies and moths easily rub off when they are handled, which isn't good for them. For this reason it is best not to handle a butterfly or moth any more than you absolutely have to. 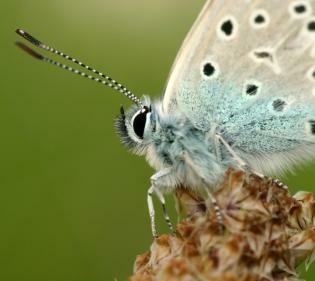 Some of the scales on male butterflies are scent scales which are used for attracting a mate. 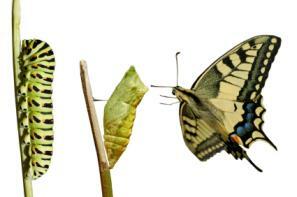 Both butterflies and moths undergo metamorphosis. After hatching from an egg they begin life as a caterpillar. Then after feeding on plants for a period of time they form a pupa (called a chrysalis for butterflies and a cocoon for moths). In the photo on your right you can see the metamorphosis of an anise swallowtail butterfly. 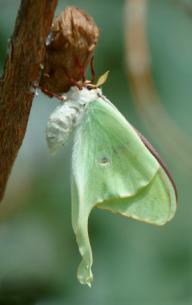 The photo on your left is of a luna moth (the green insect) that has just emerged from its cocoon. In general, a cocoon is much sturdier than a chrysalis. This is because most moths spin a silk cocoon, whereas the butterfly pupa is much more fragile and exposed. However, there are a few exceptions to this rule. As you can see from the photos, a chrysalis looks very different from a cocoon. Keep in mind that not all butterfly chrysalises and moth cocoons look identical, but in the photos you can see the general structure and shape they usually take. Butterflies generally form a chrysalis in trees or on other plants, but moths sometimes bury themselves in the ground before forming a cocoon. While in the chrysalis or cocoon stage the butterfly or moth radically changes its body shape. This is achieved by the presence of hormones within the insect's body. Once the butterfly or moth has fully developed, it emerges from the pupa. You can usually tell the difference between butterflies and moths by looking at the antenna. Notice the difference between the antenna of the butterfly in the top photo and the moth antenna in the photo below. Butterfly antennas tend to be thin with small bulbs on the end, whereas moth antennas are usually feathery and lack the bulbs at the ends. The bodies of butterflies are usually thinner than those of moths. 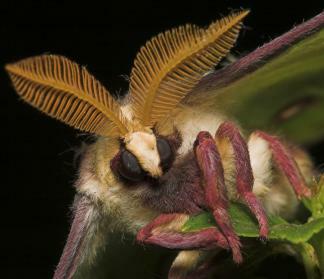 Moth bodies are also usually more "furry" than those of butterflies. Many moths also have a frenulum holding their hindwings and forewings together. In general, butterflies are most active during the daytime, whereas moths are more active at night. But there are exceptions to this rule also - there are a few moths that are active during the day. Butterflies are usually more colorful than moths, but once again there are exceptions to this rule.